Food Fight! | . : Greg Campbell | Game Designer : . Ah, the joys of childhood. Telling your teacher your parakeet ate your homework. Placing a whoopee cushion on your teacher’s chair. 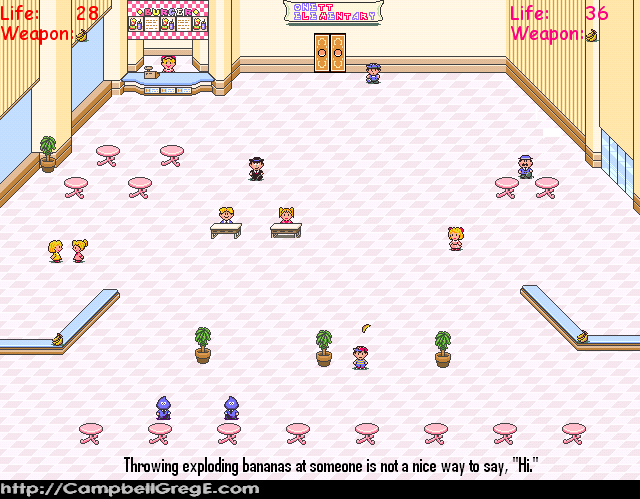 Throwing explosive bananas at your friends during lunch. You DO like throwing explosive bananas at your friends in a playful manner, right? All work and no play makes you a dull person. When you play, be nice and play fair. It’s all in good fun. Now, now children. Play by the rules and we’ll all get along. Tossing exploding bananas at surprised classmates is a good way to win, however. Smile for the camera, Ness. Your victory will be in the yearbook! EarthBound, the Mother series, and related media are property of HAL Laboratory. Yo! Noid and associated media are property of Capcom. All other copyrighted material is property of its copyright holder(s). All material not belonging to another is property of Greg Campbell.